The unique lightweight grip remains effective when wet and its slim profile transitions smoothly from the carbon tube to a comfortable ergonomic shape to minimise fatigue. The ribbed finish on the tube provides additional positive grip along its full length, and an end stop is fitted for comfort and safety. Short tiller extensions have smaller grip diameters to match typically smaller hands. The dual laminate construction has been precisely engineered for minimum weight, without sacrificing the durability required to meet the rigours of modern sailing. A combination of full length longitudinal and 45° lateral glass and carbon fibres balance optimum stiffness with extra resilience to resist breakage. 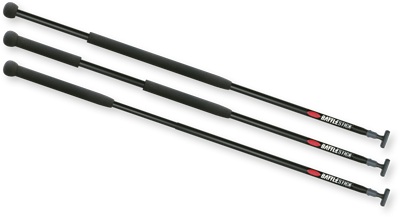 Battlesticks™ are available in six standard lengths from 610mm to 2500mm (24” to 98”) to suit virtually any class or personal preference. To facilitate cutting of the tube to a custom length the 2500mm (98”) RF3137C does not include a grip or end cap. Ronstan's unique fluted profile adds extra rigidity to the lightweight alloy section. The firm non-slip grip material does not absorb water and the large grip diameter contrasts ergonomically with mainsheet diameter to relieve fatigue. The end knob ensures safety and positive hand positioning. Telescopic versions are available in four models with a maximum length of up to 2490mm (98")long with 960mm (38") of adjustment. Single and 'Split' grip models are available.